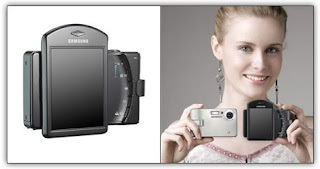 Building on its heritage in digital camera innovation, Samsung Cameras has today unveiled the sleek i7 equipped with an industry leading, intuitive, Physical User Interface (PUI) designed to make capturing and enjoying special moments an effortless affair. A must-have for any cool hunter, the i7 is equipped with a 3.0” touch screen LCD which rotates through 180 degrees allowing the user to quickly switch between features, so that they’re always ready to capture the action. An inbuilt Tour Guide function provides instant access to travel information covering 4,500 regions in 30 countries, so you’ll always know where the action is! The 7 mega pixels i7, with 3x optical zoom, has been created for those who want to capture sound, video and photos wherever they are without comprising on feature quality or design. With the LCD in neutral (0 degrees) the user can access SRS quality music files through the integrated MP3 player; with the LCD rotated to 90 degrees it’s for PMP (Portable Multimedia Player) function; and turned a full 180 degrees, high quality still images and MPEG-4 SVGA quality moving pictures can be taken. On camera editing means that it’s simple to keep the best material and cut unwanted elements without having to wait until you can get access to a computer. The i7 multimedia capabilities also provides access to the easy to use Tour Guide function providing quick access to information about places to see and things to do in over 4,500 regions in 30 countries. Further information can also be downloaded directly from the internet, and with 450 MB of internal memory you won’t need to worry about space for favorite travel tips. The Samsung i7 camera is equipped with the Samsung Advanced Shake Reduction (ASR) system and ISO 1600 high sensitivity support so that images remain crisp and detailed even without a flash. It also features the Face Recognition AF & AE so that perfect portraits of friends, family or strangers can always be guaranteed! The striking new Samsung i7 is the perfect camera packed with intelligently integrated multimedia features. The i7 will retail at £249.99 and will be available from leading high street and online retailers from mid-March 2007.